Rona Ambrose, right, says NAFTA is a matter of national interest and the country should put on a united front. The interim leader of Canada's opposition says she's feeling a bit reassured after meeting U.S. President Donald Trump's point man on NAFTA. 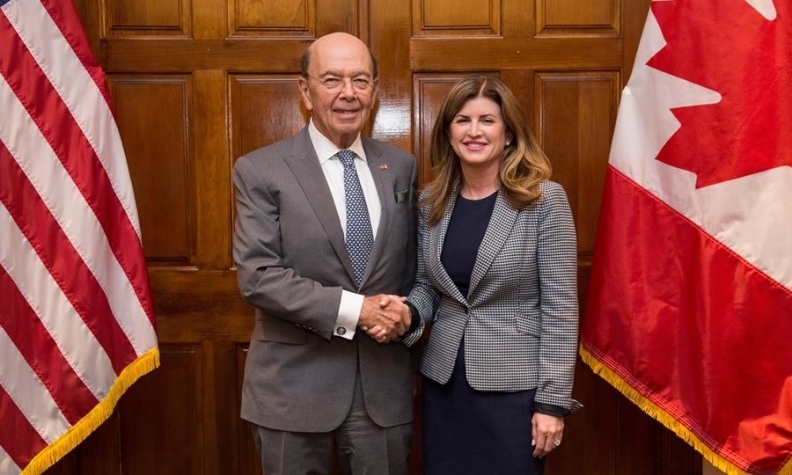 Rona Ambrose met Commerce Secretary Wilbur Ross during a visit to Washington on Monday. She says he made it clear he understands not only the value of the business relationship between Canada and the United States, but also the need to provide stability and business confidence. That desire to calm the business-investment climate is one reason the interim Conservative leader says she favours a faster NAFTA renegotiation. “When we’re strong trading partners we all succeed,” Ambrose wrote in a separate post. Ambrose's press secretary, Jake Enwright, told Automotive News Canada that while the auto industry wasn't specifically discussed, things like the possibility of a border adjustment tax were. Enwright said Ambrose and her fellow Conservatives are interested in more free trade with the United States, not less, and they're against anything that deters the free flow of goods, including vehicles and automotive parts. Ambrose was accompanied at her meeting with Ross by David MacNaughton, the Liberal-appointed ambassador to the United States. Ambrose has made it clear her party will work with the government during the NAFTA talks and not use them for partisan advantage; she says it's a matter of national interest and the country should put on a united front. Former Conservative prime minister Brian Murloney, who negotiated the original pact between Canada, the United States and Mexico in the 1990s, has been advising current Liberal Prime Minister Justin Trudeau and his government on NAFTA since Trump’s election. Meanwhile, Trump on Tuesday promised a group of business leaders "pleasant surprises" from planned renegotiations of the decades-old pact. Trump spoke at a White House meeting with the leaders who are part of his strategic and policy forum. Trump said the agreement has "been a disaster since the day it was devised." In addition to "pleasant surprises for you" on the NAFTA front, Trump reiterated his commitment to cutting taxes and regulations.